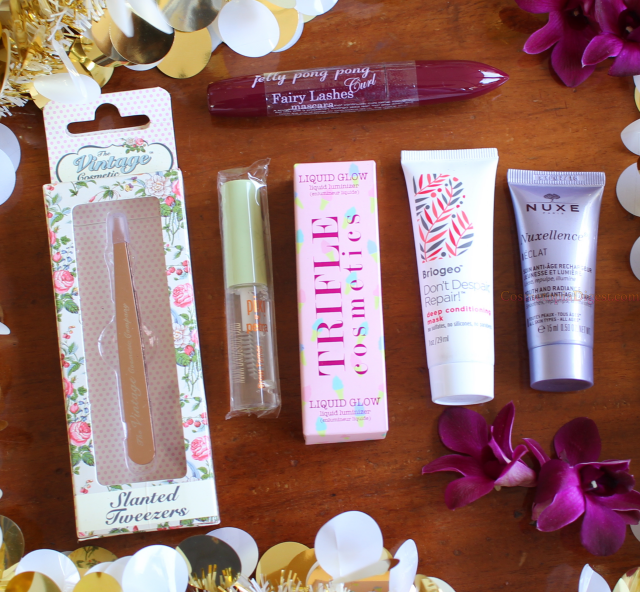 The first LookFantastic Beauty Box of the year is here. It is themed the Beauty Revolution Edition, meant to overhaul our routine and help make new beauty discoveries. 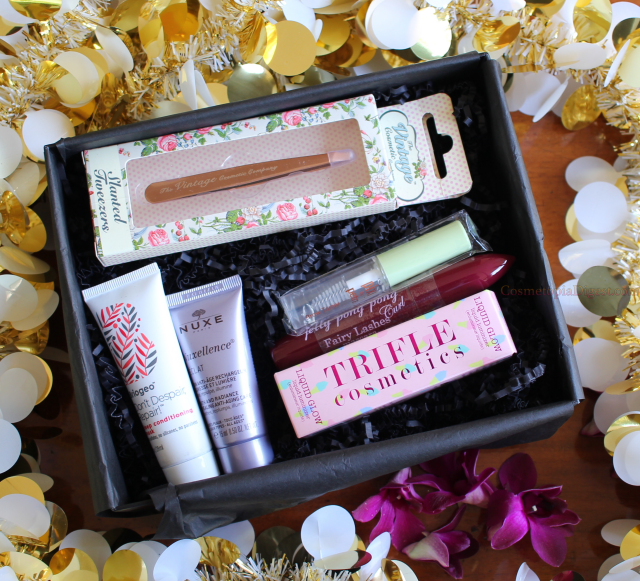 You would expect this box to be skincare-centric, but three of the products are actually makeup this time! I love the positive design of the box itself. Lots of hope for the new year. 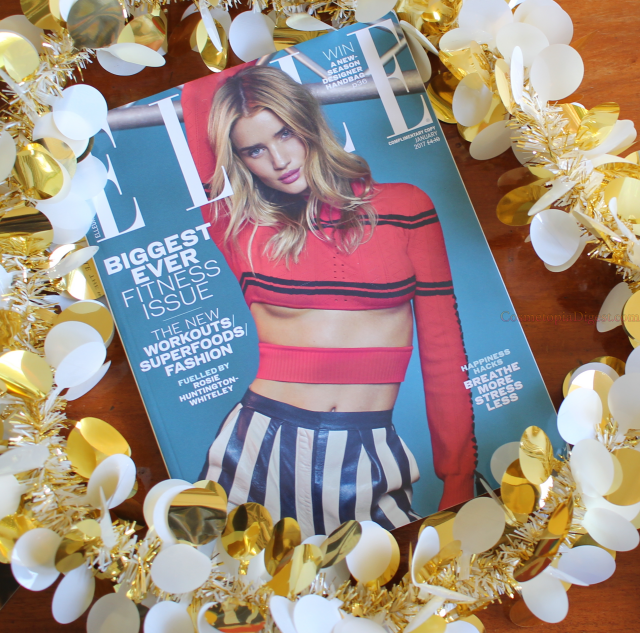 The box comes with the January edition of the Elle UK magazine, and the regular beauty-box magazine, which is now glossy and contains breakfast recipe ideas and lifestyle articles, apart from more on beauty products. 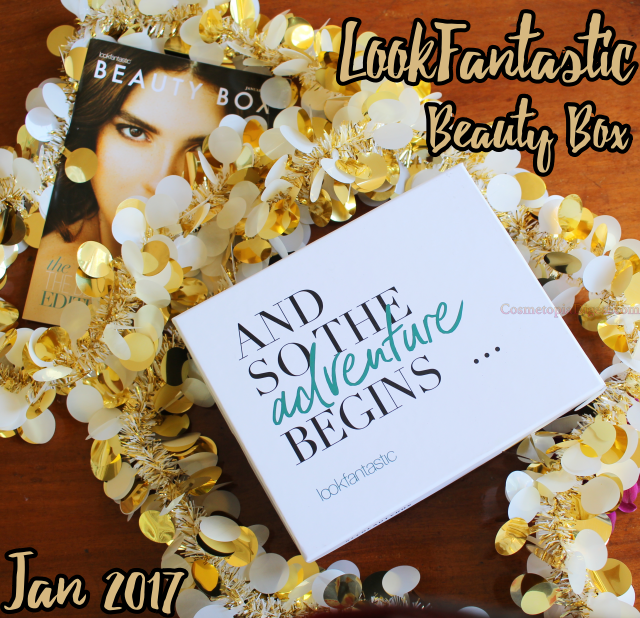 Scroll down for the contents of the LookFantastic Beauty Box January 2017. I love the Vintage Cosmetics Company's makeup brushes, and this rose gold pair of slanted tweezers is another win from the brand. Since I'm always misplacing tweezers, it is good to have another one - and, a rose gold one at that! Highlighting is going nowhere anytime soon! This is a rosy-tinted liquid highlighter that also contains cocoa butter to hydrate and soothe the skin. Unfortunately, rosy-tinted spells unworkable on my yellow-toned skin, so this goes into the giveaway box. I've received this before, in a So Susan Lip Love Bag. This is a neat little mascara that doesn't clump or give a spidery look. Since I already have a tube, this also goes into the next giveaway box. An aloe vera and panthenol based gel meant to keep your brows in place through the day. I actually prefer a tinted gel or mousse, so I don't have to bother with two separate steps (filling in and keeping in place). I wish this had been tinted. Goes into giveaway box. A lightweight skin emulsion that contains passion flower and hyaluronic acid for moisture. This is great for layering beneath facial oils, emollients and occlusives such as sleeping packs and heavier creams. Will incorporate in my routine! Another product that I have used before and loved. Contains avocado oil and Vitamin B complex. Deep-hydrates parched hair. Will definitely use up shortly. I love the more-makeup trend of this box and hope that the rest of this year's boxes also contain more makeup. I also love that there are three full-sized products in this box. The only not-so-wow product for me is the non-tinted brow tamer. All in all, a very good month - may all the boxes of 2017 be like this! For those who came in late, LookFantastic ships worldwide. Each box costs £15, but longer subscriptions cost only £13 per box, which is deducted only when the box ships and not as a lump-sum. Go here to subscribe. Stay tuned for next month's unboxing!